With a bit of practice, you can view images of sugar and salt in 3D without special glasses. Ultraviolet light reveals spectacular colorful fluorescence of Coltsfoot inflorescences, which beauty can be fully appreciated only under the magnification of a microscope. Breath new life into your microscope hobby. Here is a new way to view many of the same subjects you have looked at before. Both staining and auto fluorescence can be used to visualize the spleen cells. Gneiss, a metamorphic rock and term used to designate the texture and extent to which a rock has been changed. 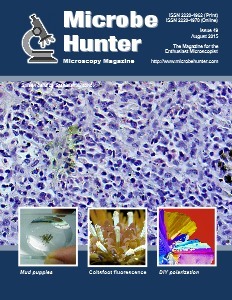 Water life and Haematococcus images. Mudpuppies are salamanders that live an entirely aquatic life-style.